Alpha Winters is a formidable force. He took over the pack when he was 16, and if that wasn't enough he has fought and defeated 3 separate packs, taking over their wolves and land. He has created a superb government and the only town in North America that has only werewolves. He has created a business empire to support his pack and to create weapons. He has prepared his pack for any threat that comes their way. Because of all of this his pack has increased exponentially from 200 to 20,000 werewolves. He is a great leader, secretive, mysterious... no one knows much about him and those that do cannot tell you. He is a myth. He is a legend. He is a..... she. Alpha's are males and Luna's are females.... right? That is how it has always been. There is no way that a girl could do all of this..... right? Christine Winters has been hiding behind her nickname Chris since she became Alpha of her pack at the age of 16. 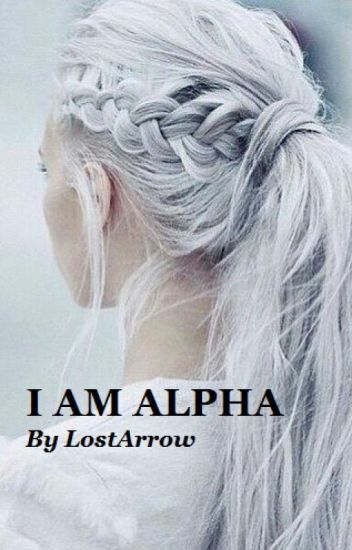 She is the oldest daughter of the Alpha and when their pack was attacked they killed not just her family but everyone who was a part of the Alpha bloodline. By sheer luck, Christine made it out, and on the next full moon, she phased for a second time to an Alpha. No one outside of Alpha Winters pack knows the true secret, but now the psychopath that killed her family is back and threatening to massacre everyone. A war council has been called to deal with the threat. The war council (consisting of all the alpha's in the surrounding area) agreed they need the infamous Chris Winters to join them. Will they accept her? or reject her? Will any of them have a choice?.... After all, She is an Alpha. Chapter 7 part 1 Thank you for insulting the help! Chapter 7 Part 2 Thanks for insulting the help! Chapter 8 Part 1 "Haven't you had enough?" Chapter 8 Part 2 "Haven't you had enough"
Chapter 9 part 1 "Hello Boys"
Chapter 9 Part 2 "Hello Boys"
Chapter 9 Part 3 "Hello Boys"
He had strength, she had powers she didn't know she had. He hated her after what her parents did to his family, she didn't know her parents were even alive. He saw the face of his parents murderers everytime he looked at her, she felt the pain everytime he looked at her with disgust. But alas, fate has other plans, plans which included pairing the enemies and breaking up friends. What begins in escaping the rejection of her mate ends in escaping death alongside him. So, in this war of bonds over blood relations , who wins? Well, what are you waiting for? Let's find out. Disclaimer : The image in the cover is not owned by me. Nor are the images and media used in the book. #27 in Werewolf on 07/12/17. Alexis Gray is a killer. Known infamously as Red Death, she has death held at her fingertips. Her style is bloody, bold, and merciless with no room for imperfections. Her heart has long turned cold by a perfect murder record. She's the best at it all. She's a friend. Apart from being an internationally infamous killer, she balances a normal life. Her work rests on loyalty-and money-but when you betray a teenage girl with a high tendency to kill-all hell breaks loose. She's a runaway. Compromised and hunted down by the nations most wanted gangs, she finds herself in a blood bath. Tricks, lies, and deceit come along. But something else surfaces-something she didn't expect-her heart. Murder is an art form and she has it mastered. In a life of running and murder, there's only one thing left to do-kill or love? 1 Girl. 4 Boys. Pick a target. Warning: may contain graphic descriptions of murder. They thought life might return to normal. They were wrong. After putting a stop to Elise's genocidal plans to exterminate humans with the wolf gene, the Alliance thought they were done with the Unum Sandalf Alpha. However, odd animal attacks and bizarre creature sightings point to Elise's return. Now with the CDC and a secret government department aware of genetic differences in some humans, they must find Elise before the entire werewolf community is exposed. However, as they get closer to tracking down the elusive Elise, things aren't quite as they seem, and the team is confronted by hybrid creatures' which are not quite human-and not quite wolf. Can the team stop Elise before their race is exposed and humans discover they are not the only ones at the top of the evolutionary scale? PS. this is not a werewolf-vampire story guys. First story written on Wattpad. Hope you like this Peter Pan love story. In this story there is no heart of the truest believer. Pan is still selfish, but not a monster. There is no hourglass measuring the time Peter Pan has left. Neverland truly is a place where time is frozen; however, it still had its dangers. Hate. Contempt. The only emotions Murphy O'Neill is capable of. Hate for Elijah, the Werewolf who brutally and savagely killed his mate. Contempt for the Alliance, who allowed the murderer to escape. A string of gruesome slayings in Boston points to Elijah's return, and Murphy is determined to track him down and make him pay for destroying his life. The one thing stopping him? A mouthy, opinionated FBI agent who just can't be told to mind her own business. Twenty years ago, the Boston Wolf Killer suddenly disappeared without a trace. The killings stopped and the city began to breathe again. Kaitlyn Quinn's father, a detective with the Boston PD, was the last victim before the police and FBI lost all trace. Special Agent Quinn has been assigned to the FBI's task force to track this killer down. For Kaitlyn, it's personal. She intends to bring her father's killer to justice no matter the cost. Even if it means teaming up with an ice cold, emotionless FBI Profiler. Everything is not as it seems, and Kaitlyn is thrust into a world she didn't know existed. To catch the psychotic killer, Kaitlyn and Murphy must put aside their animosity and navigate the thin line the separates their two worlds. Sita is one of the lost members of The Moonstone Pack, a pack that was destroyed when she was a pup. She doesn't remember much of her childhood within the pack, she barely knows anything about her species or the supernatural world. She can only rely on what her father figure has told her. But Sita's past isn't gonna stay in the past, nearing her 16th birthday and her first shift, she realizes that she will have to fight for her life, with the help of mercenary Hell Hound Member and other supernatural creatures. Can she survive the things thrown at her, or will it consume and destroy her? #1 in Cozymystery various times! Only a week since she caught the solstice killer, and Myrtle Coldron, amateur witch, amateur sleuth, is once more courting disaster: More bodies keep popping up. The first has been hanging around for a while--only bones are left. The second is a bit fresher. -- And that's only the murder part of  the mystery. Magic is even more of a puzzle for Myrtle and the other supernatural misfits that make up the Avebury coven. Especially, when they discover they're on a timer. To stop the final countdown, the Avebury witches have to hunt down magical implements. What they are? Nobody knows. Where they are? Nobody knows either. It appears, when the witches' inconsiderate ancestors left this Earth, they  took all the tools of their trade with them. There are 12 werewolf packs in the United States: six of them are called peaceful and the other six are called bloodthirsty. In the six bloodthirsty packs, their Alphas are searching for their Lunas. These people are reputed to be coldhearted and ruthless bastards. People either pity the poor girls who will be their mate or want to be said girls. What happens when the mates of these big bad Alphas meet them and decide to run? How will the Alphas handle them especially when they found a leader who outsmarts them at every turn? She is the daughter of the Alpha of her pack, the Thunder Manes. They are one of the peaceful packs. Isabella finds her mate in the Alpha of the most agressive one, Carson. Wanting to keep her freedom intact, she runs. Isabella is now a rogue or rather renegade Luna. Along the way, she meets the other five Lunas who are running away from their respective mates. They all want out of their situation. Can Isabella find a way to help and end this endless cycle? Or will the group never stop running? "Too Much Sass for the Alpha"
Jasper is the top spy and assassin of the supernatural council and she is a independent gear head. She has seen countless others try to resist the mate bond. She is determined to resist and stay that badass, tattooed  gear head she has been all of her life. Being a werewolf means you have a mate someone your destined to be with and she hates it. When spying on a pack and searching for rogues and possible breaks in the supernatural law she gets discovers a male more importantly the alpha of alphas and the leader of the strongest pack of the whole entire world also he happens to be her mate. Roman is the most posesive alpha he is 23 and hasn't found his mate yet and is slowly descending into insanity he has broken multiple of supernatural worlds laws to find his mate. He has visited all of the packs in the world and has yet to find his mate.